Advanced Accelerator Applications S.A., incorporated on March 1, 2002, is a radiopharmaceutical company. The Company develops, produces and commercializes molecular nuclear medicine (MNM), diagnostic and therapeutic products. MNM uses trace amounts of radioactive compounds to create functional images of organs and lesions and to treat diseases, such as cancer. The Company is engaged in developing its therapeutic candidate, Lutathera, which is a compound for the treatment of neuro endocrine tumors (NETs). It has a portfolio of approximately six diagnostic positron emission tomography (PET) and single-photon emission computed tomography (SPECT) products. PET and SPECT are imaging techniques in molecular nuclear diagnostics (MND) with applications in clinical oncology, cardiology, neurology and inflammatory/infectious diseases. The Company's products in clinical development include Lutathera, Somakit and Annexin V-128. Its commercial products include Gluscan/Gluscan 500/Barnascan, IASOflu, IASOdopa, DOPAVIEW, IASOcholine, AAACholine, MIBITEC/Adamibi and Leukokit. Advanced Accelerator Application operates in Belgium, Canada, France, Germany, Israel, Italy, the Netherlands, Poland, Portugal, Spain, Switzerland, UK and USA while its distribution network covers more than 30 countries. The group currently has 22 production and research & development facilities that manufacture both diagnostic and therapeutic Molecular Nuclear Medicine products, and over 470 employees in 13 countries. 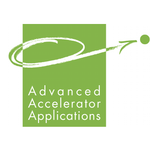 Advanced Accelerator Applications was founded in 2002 by Italian physicist Stefano Buono as a “spin-off” of the CERN. 2003, AAA constructed first radiopharmaceutical laboratory in the Technoparc of Saint-Genis-Pouilly. 2004, AAA received marketing authorization from the Swiss Authorities to commercialize GLUSCAN. January 27, 2009, AAA completed the acquisition of Gipharma, an Italian pharmaceutical contract manufacturer for injectable and freeze-dried products. October 3, 2009, AAA awarded by Deloitte Fast Technology 50 as the fastest growing technology company. August 9, 2010, Advanced Accelerator Applications announces research and supply partnership with the Institut Curie in Paris. December 16, 2010, Advanced Accelerator Applications receives GMP approval to manufacture Lutate for treatment of NeuroEndocrine Tumors. August 1, 2011, AAA acquires rights to oncology antibody treatment FabOvar from Dompé. October 21, 2011, GE Healthcare agrees on a manufacturing agreement with AAA to establish a pan-European PET Tracer production capability. March 26, 2012, AAA announces strategic steps in the expansion of its European PET manufacturing network. September 19, 2012, AAA announced start of pivotal phase III trial for Lutathera® in cancer patients with progressive midgut carcinoid. January 16, 2013, AAA enters Polish market following agreement with University of Warsaw. January 29, 2013, AAA strengthens European radiopharmaceutical manufacturing network, acquires two well established companies in Spain. May 23, 2013, AAA announces manufacturing and service agreement to supply Amyvid™ (Florbetapir (18F)) solution for injection in France, Italy and Spain. April 29, 2014, Kapil Dhingra, Former Head of Roche Oncology, joins AAA's Board of Director. May 26, 2014, Advanced Accelerator Applications appoints François Nader, M.D., to Board of Directors. September 11, 2014, AAA acquires GE Healthcare’s FDG-PET Radiopharmaceutical business in Italy. January 8, 2015, Advanced Accelerator Applications announced that it has acquired the remaining 49.9% of Atreus Pharmaceuticals Corporation, a development-stage biopharmaceutical company headquartered in Ottawa, Canada. November 11, 2015, Advanced Accelerator Applications opened for trading at $18.50 after pricing 4,688,000 American Depositary Shares at $16, the middle of the expected $15-$17 range. January 7, 2016, Accelerator Applications S.A., announced that it has acquired 100% of the shares of the IDB Group. The IDB Group includes IDB Holland bv, IDB Radiopharmacy. May 26, 2016, Advanced Accelerator Applications expands its presence in Germany with strategic acquisition of two production sites.